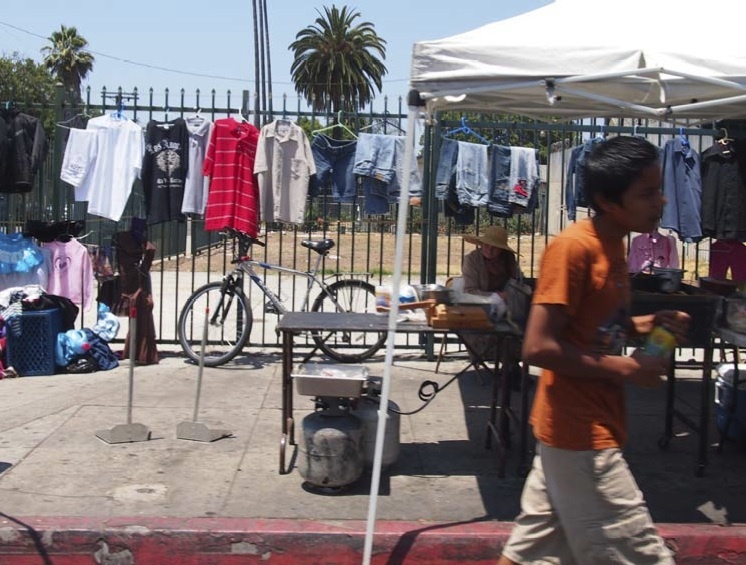 Street vendors along Compton Avenue from 60th Street to Slauson Avenue. 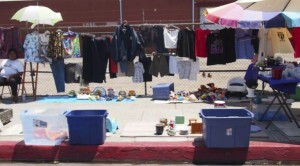 For years now, residents and business owners in the Florence-Firestone section of Los Angeles County have complained about street vending lining Compton Avenue from 60th Street to Slauson Avenue, where everything from ice cream to t-shirts to CD’s and DVDs or bicycles and infant car seats are available for sale. While these sidewalk swap meets provide income for some, they are a constant nuisance for local residents who live in the area, a drain on tax revenues and a hardship for mom-and-pop businesses that are forced to compete with vendors that literally set up shop directly in front of their venue. They are also a public health hazard –vendors sell food that often is improperly stored or prepared in unsanitary conditions. To address this problem, which over the years has become increasingly entrenched, the Board of Supervisors , acting on a motion brought by Chairman Mark Ridley-Thomas , called for county departments, including the departments of Regional Planning, Public Health and the Sheriff’s Department, to coordinate with each other and create an ordinance that would abate the problem. The motion also called for the departments to seek ample input from businesses, vendors and residents, who would be affected by new rules. Residents complain that as early as Thursday night, customers for the street vendors park and sleep in their cars to reserve a spot for shopping Friday through Sunday. Not only is the congestion a neighborhood nuisance, many brick-and-mortar shop owners have trouble making ends meet, unable to compete with the lower prices offered right in front of their stores. Antonio Moreno, owner of a mini-mart in the Florence-Firestone area, told the supervisors that he rarely turns a profit on weekends, due to the 400 vendors who typically line the street, selling the same merchandise that he and other store owners sell too. Also, community members have noted that many of the unauthorized vendors are not from the area, but have come to Compton Avenue because the laws against unlicensed vending are more rigorously enforced in other cities. Officials should collect a daily tax from these vendors every time they are on the street selling their products. This collected tax should be reinvested in the communities where they are selling their products. If I have to pay taxes- so should they! Enforce the law about no outside sales, and provide public space for community markets and swap meets. As a history major at CSUDH in 2009 i researched and prepared my senior thesis on Street Vendors, which enabled me to become aware of their plight. However, it is a injustice to the businesses in this particular area addressed (Florence-Firestone) to those who have required business licenses, order and invoice merchandise, required to have health permits, contract with public utilities and other required licenses and fees. The rights of these business owners need to be protected. Unfortunately there must be public ordinances to protect and assist their assets. Illegal street vendors should not be tolerated. There must be specific guidelines created and enforced. In areas where they sleep, post no parking signs between certain areas. In some cities, street vendors merchandise is confiscated and destroyed. Yes, it’s unfortunate but something must be done to curtail this illegal practice. 1. Yes – I agree to Enforce the Law regarding Having a Licence to Sell. 2. Encourage Street Vendors to Go To Outdoor Swap Meet Facilities to sell at a Lower Rates for less Licence Laws. Swap meet Area. Locals come & go there easily. 1. I Also Agree that these Street Venders – NOT be allowed to Set up SHop In Front of Other Mom & Pop Stores. For Many Reasons, Safety of Persons, Safety of Food Preperation, Taking away Customers from Mom & Pop Store causing their Revenue to Drop. I Thought it was against the Law to Set up a Non- Licenced Business in front of a Legal Business. We need to Reinforced that Law . Make everyone get a permit to sell and create an area for a flea market type of situation that is open on Saturday and Sundays away from the markets and stores. Also fine anyone selling within a certain distance to a store or market on all days. The laws in place should be enforced. “Street vending” is illegal and it violates several laws. We should never pick and choose which laws should be enforced. The residents in this area are fed up and need support from the district. The 90001 residents are begging for assistance. Someone should step up and take care of business! Maybe we can take them to your neighborhood and have them post up in front of your home/business? I’m sure this will make you change your mind about street vending.